Philadelphia – Penn Dental Medicine is helping to improve access to care for persons with disabilities through a commitment to provide continuing education and educational content to dentists on how to manage this special population. AmeriHealth Caritas, one of the nation’s largest Medicaid managed care organizations, has partnered with Penn Dental Medicine and Temple University’s Maurice H. Kornberg School of Dentistry to utilize the schools’ education programs as part of its Inclusive Dental program, a new initiative by the company aimed at expanding community-based dental care for persons with disabilities. In conjunction with the April 1 launch of Inclusive Dental in Southeastern Pennsylvania, the inaugural continuing education program of this partnership was held at Penn Dental Medicine on March 30 and at Temple on March 29, drawing more than 80 practitioners from the region. The program included lectures on defining disability; communicating effectively with parents, caregivers, and patients; principles of dental care for persons with disabilities; and treatment options through the lifespan. “It is vital that we teach dentists how to deliver care to persons with disabilities in a culturally sensitive way, in the office, in the community setting,” says Penn Dental Medicine’s Morton Amsterdam Dean Mark Wolff, who committed to the Inclusive Dental project prior to joining Penn Dental Medicine through his work with Project Accessible Oral Health (PAOH) — a national nonprofit focused on improving access to oral health care for the disabled community, where he serves on the PAOH Education Committee with AmeriHealth Caritas Corporate Dental Vice President Dr. Lawrence Paul. At a press conference held Friday, March 29, to announce the launch of Inclusive Dental, Dr. Paul noted that in talking with dentists in the company’s network of providers one of the key barriers to treating individuals with disabilities was lack of training. “Both Penn and Temple have made institutional commitments to really create a program that begins to address the training needs of dentists,” said Dr. Paul. Expanding clinical care services for persons with disabilities and increasing the educational experiences with this population for students is a top priority for Dean Wolff, with plans moving forward to create a patient care center at Penn Dental Medicine devoted exclusively to serving these individuals. “As a dental school, we can bring resources to this issue on multiple levels – through these continuing education programs and educational resources for practitioners in the community, through the hands-on education of our students, and by being a center of care in the community,” says Dean Wolff. 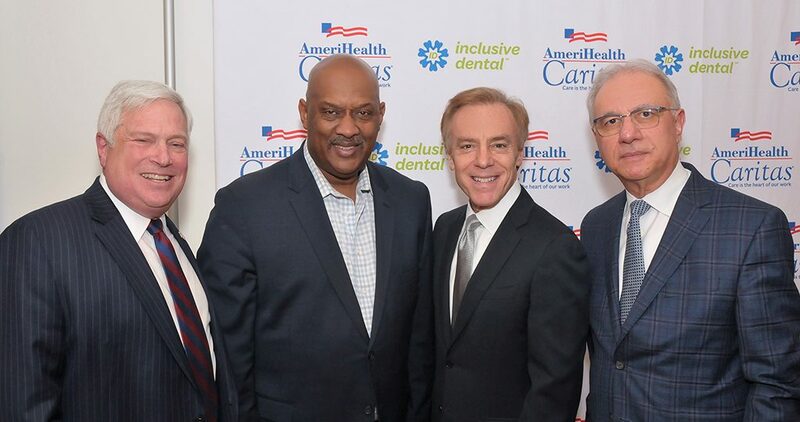 To date, a network of 40 dental offices in Philadelphia and the surrounding four counties have been recruited by AmeriHealth Caritas to offer dental care to its members with disabilities through the Inclusive Dental program. While the program is launching in this region, the company plans to expand it to the other markets it serves throughout the country.